Along the rugged west coast of North America, British Columbia will experience some of the plate subduction problems troubling the western part of the United States, but with a difference. Canada, in this area, will be stretched, with it's upper part attached to the all the way over the North Pole, into Russia. As the western United States is pushed and crumpled, the lands it is attached to will be stretched. This tends to alleviate any crumpling that occurs due to the subducting Pacific plate, a trade-off. Nevertheless, this makes for a rugged ride, as these adjustments are never smooth, here crumpling, there stretching, so being on solid rock to lessen the impact is wise. Solid rock is less likely to crumple or shift, the pressure shifting to soil or broken rocks nearby. 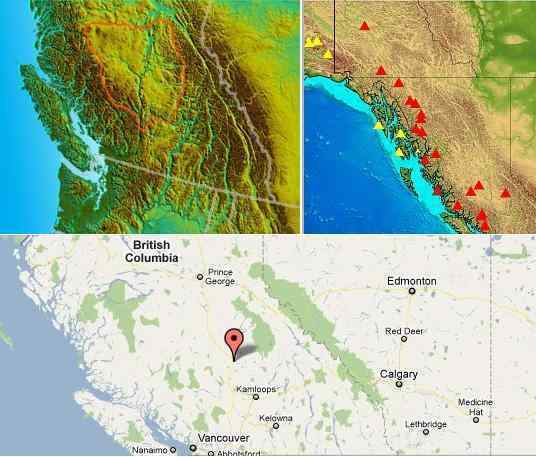 In addition, the southern portion of British Columbia is close the Mt. St. Helen volcano, which will surly erupt during the shift, at times violently. Firestorms are created due to air turbulence over volcanoes, the super-heated air creating petrochemicals drifting in the tail of the 12th planet, which is lashing the Earth's atmosphere as the 12th Planet passes between the Earth and the Sun. Thus, where these walls of fire can fall anywhere, they are more likely in the vicinity of volcanoes. Winds will move in all directions, in chaos, during the hour of the shift. Those living near volcanoes or in forested areas that can be set afire should seek shelter in the earth, in bermed structures or those with metal or sod roofs, until the hour of the shift has passed. Cities clustered along the Continental Divide, particularly in what is now the southern portions of British Columbia, will find the ride through the pole shift particularly stressful. The Continental Divide represents the point of pressure where subducting plates have forced themselves under overplates, and thus this will be the point there the divide moves further inland. Thus, sudden breaks in the rock, rock stratas jerking suddenly upwards and no longer level where they were before, can be expected. Water mains, housing, roads and bridges, and even the direction that rivers flow will be disrupted. After the shift, British Columbia will be well situated, with a warm climate near the ocean, and high ground that will be above the water line when the poles have melted. The Caribou region, at the 100 Mile House, is likely to have volcanic ash blowing down toward Vancouver Island, rather than overland in British Columbia, though you would have volcanoes on either side of you.